At at a Tuesday event, Myspace and new owner Specific Media will detail plans to revive the dying social network. According to a document leaked to AllThingsD, the key to a successful resurrection will be music, music, and more music. 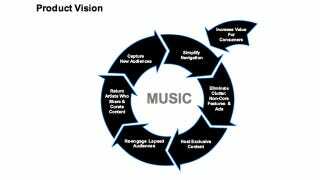 The leaked pitch deck suggests Myspace wants to become "the #1 online community music destination." Myspace is already known as a place for musicians to hang out, but it seems as if Specific Media wants to take this one step further.